Waxing is like cooking. You can use all kinds of fancy ingredients and make a great meal, but some of the simplest recipes are still the best. Waxing can also be complicated, but the simplest waxing can work the best and, for everyday the basics are all you really need. This guide is meant to be a starting point, as there is lots of other information available on the web. So let's keep it simple shall we? polar/white (-10 deg C and colder) or green base wax. * A cold glider will work 80-90% of the time in Fort McMurray. Classic skis have a grip zone under the middle of the ski. To determine your grip zone, use the Paper Test as described in the Ski Buying Guide. This time, use a permanent marker, and draw a little line on the ski at the leading and trailing edge of the pocket where the paper moves freely under the ski. This is your grip zone or wax pocket. You will apply grip wax between the marks. You can verify your wax pocket, by checking your base after a ski to see how much wax is left. 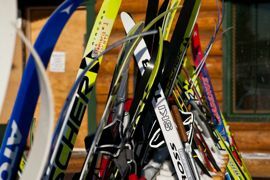 If the "grippy" part of your ski is much shorter than what you had applied before heading out, you want to consider shortening your grip zone. Conversely, if you find you are not getting enough grip, you may want to consider lengthening your grip zone. If you are waxing your skate ski, you will apply glide wax to the entire ski. If you are waxing your classic skis, tape off your grip zone with a piece of masking tape across the base of the ski at each mark. Your glide was will be applied outside the tape markers, on the tips and tails of your skis. 2. Clean any debris from the base of your ski. Use your nylon brush to brush off any residue, running the brush from tip to tail. 3. Test your iron, to make sure it is just warm enough to melt the wax. The cooler the better, a hot iron can seriously damage the base of your ski. If it is smoking it is far too hot! 4. Warm your block of glide wax on the iron, and drip or crayon it on to the base of the ski. 6. Scrape the excess wax from the edges of your ski, and from the groove(s) with the groove scraper. 7. Allow the wax to cool. While you're waiting, do steps 1 to 6 on your other ski! 8. Using your plastic scraper held in both hands, scrape the excess wax from the base of the ski. Hold the scraper parallel to the base of the ski, and use long strokes from tip to tail. Keep scraping until very little wax is coming off the base. 9. Brush the base of your ski with the nylon brush, using long strokes from tip to tail. If this still sounds like too much, there are new glide waxes on the market that do not need to be ironed into the base, such as spray on or rub on glide waxes. These may be a good option for the beginner recreational skier. 4. Work the wax into the base by rubbing it in firm, fast, back and forth strokes with your cork. 5. Repeat steps 3-4 until you have enough layers. A good rule of thumb is 1 layer of grip wax per 5 kms of skiing. If you have any questions, ask! 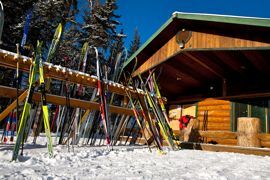 Ask another skier, or stop by the cabin and ask an instructor.